The Northeast has witnessed a growth of 5.2 per cent in the tourism sector last year and better road connectivity and infrastructure will simply boost tourism in the region. 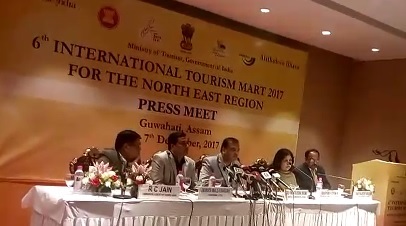 Addressing a press conference at Guwahati on Wednesday secretary of union Ministry of Tourism Rashmi Verma said the focus of the ongoing International Tourism Mart is to identify the opportunities and challenges to attract more tourist footfalls in the Northeast. As the majority of the Northeastern states share international borders with ASEAN and BIMSTEC countries, the participants identified geopolitical drivers of tourist flows in the future in view of India’s focus on ‘Act East’ policy. Rashmi Verma said 1.6 crore foreign tourists visited the region last year while the number of domestic tourists was 77 lakhs. She said the tourism potential of the Northeast has mostly remained untapped and the focus of this international tourism mart is to promote tourism in the region.